Bhatia, A.; Gerndt, M. and Cardoso, J. Efficient Failure Diagnosis of OpenStack Using Tempest. In IEEE Internet Computing, Vol. 22 (6): 61-70, 2018. García, J. M.; Fernandez, P.; Pedrinaci, C.; Resinas, M.; Cardoso, J. and Cortés, A. R. Modeling Service Level Agreements with Linked USDL Agreement. In IEEE Transactions on Services Computing, Vol. 10 (1): 52-65, 2017. Cardoso, J.; Pedrinaci, C.; Leidig, T.; Rupino, P. and Leenheer, P. D Foundations of Open Semantic Service Setworks. In International Journal of Service Science, Management, Engineering, and Technology, Vol. 4 (2): 1-16, 2013. Leenheer, P. D; Cardoso, J. and Pedrinaci, C. Business Service Semantics: Case Study for Flanders Research Information Space. In International Journal of Information System Modeling and Design (IJISMD), Vol. - (-): -, 2013. Cardoso, J. and Bussler, C. Mapping between heterogeneous XML and OWL transaction representations in B2B integration. In Data Knowl. Eng., Vol. 70 (12): 1046-1069, 2011. Jung, J-Y. ; Chin, C-H. and Cardoso, J. 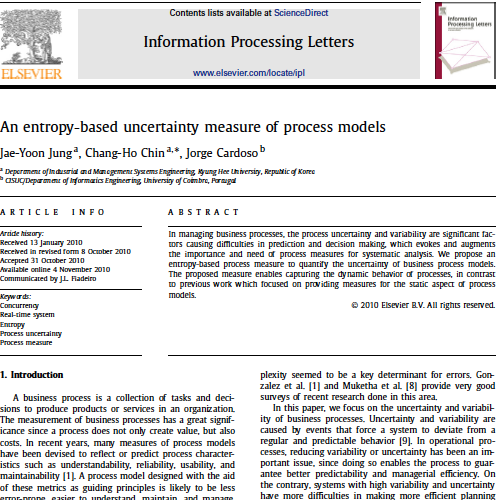 An entropy-based uncertainty measure of process models. In Information Processing Letters, Vol. 111 (3): 135-141, 2011. Terziyan, V.; Katasonov, A.; Cardoso, J.; Hauswirth, M. and Majumdar, A. PRIME: Proactive Inter-Middleware for Global Enterprise Resource Integration. In Eastern-European Journal of Enterprise Technologies, Vol. 51 (3/12): 3-16, 2011. Cardoso, J. Business Process Control-Flow Complexity: Metric, Evaluation, and Validation. In International Journal of Web Services Research, Vol. 5 (2): 49-76, 2008. Cardoso, J.; Bussler, C. and Guerra, F. Search Using Metadata, Semantics and Ontologies (Preface). In International Journal of Metadata, Semantics and Ontologies, Vol. 3 (1): 1-2, 2008. Rodrigues, T.; Rosa, P. and Cardoso, J. Moving from Syntactic to Semantic Organizations using JXML2OWL. In Computers in Industry, Vol. 59 (8): 808-819, 2008. Cardoso, J. Complexity Analysis of BPEL Web Processes. In Journal of Software Process: Improvement and Practice (InterScience, Wiley), Vol. 12: 35-49, 2007. Cardoso, J. The Semantic Web Vision: Where Are We?. In IEEE Intelligent Systems, Vol. 22 (5): 84-88, 2007. Cardoso, J. and Lange, C. A Framework for Assessing Strategies and Technologies for Dynamic Packaging Applications in E-Tourism. In Information Technology and Tourism (Cognizant Communication Corporation), Vol. 9 (1): 27-44, 2007. Cravo, G. and Cardoso, J. Termination of Workflows A snapshot-based approach. In Mathematica Balkanica, Vol. 21 (3-4), 2007. Caires, B. and Cardoso, J. Using Semantic Web Technologies to Build Adaptable Enterprise Information Systems. In Journal of Interoperability in Business Information Systems (IBIS), Vol. 1 (3): 41-58, 2006. Cardoso, J. Approaches to Developing Semantic Web Services. In International Journal of Computer Science (IJCS), Vol. 1 (1), 2006. Cardoso, J. Developing Dynamic Packaging Systems using Semantic Web Technologies. In Transactions on Information Science and Applications, Vol. 3 (4): 729-736, 2006. 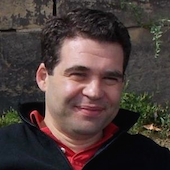 Cardoso, J. Poseidon: A framework to assist Web process design based on business cases. In International Journal of Cooperative Information Systems (IJCIS), Vol. 15 (1): 23-55, 2006. Cardoso, J. and Lenic, M. Web Process and Workflow Path mining using the multimethod approach. In International Journal of Business Intelligence and Data Mining (IJBIDM), Vol. 1 (3): 304-328, 2006. Cardoso, J.; Bostrom, R. P. and Sheth, A. Workflow Management Systems and ERP Systems: Differences, Commonalities, and Applications. In Information Technology & Management, Vol. 5 (3/4): 319-338, 2004. Cardoso, J.; Miller, J. A.; Sheth, A.; Arnold, J. and Kochut, K. Quality of service for workflows and web service processes. In Journal of Web Semantics, Vol. 1 (3): 281-308, 2004. Anyanwu, K.; Sheth, A.; Cardoso, J.; Miller, J. A. and Kochut, K. Healthcare Enterprise Process Development and Integration. In Journal of Research and Practice in Information Technology, Special Issue in Health Knowledge Management, Vol. 35 (2): 83-98, 2003. Cardoso, J. and Sheth, A. Semantic e-Workflow Composition. In Journal of Intelligent Information Systems (JIIS), Vol. 21 (3): 191-225, 2003. Kochut, K.; Arnold, J.; Sheth, A.; Miller, J. A.; Kraemer, E.; Arpinar, B. and Cardoso, J. IntelliGEN: A Distributed Workflow System for Discovering Protein-Protein Interactions. In Distributed and Parallel Databases, An International Journal, Special issue on Bioinformatics, Vol. 13 (1): 43-72, 2003. Cardoso, J.; Sousa, J. P. and Teixeira, J. C. SketchPad on the PowerMac. In Computer Graphik Topics, Vol. 7 (4): 25-26, 1995. Fromm, H. and Cardoso, J. Foundations. In Fundamentals of Service Systems, pages 1-32, Springer, 2015. Cardoso, J. and Fromm, H. Electronic Services. In Fundamentals of Service Systems, pages 33-74, Springer, 2015. Feldmann, N. and Cardoso, J. Service Design. In Fundamentals of Service Systems, pages 75-103, Springer, 2015. Stadtmueller, S.; Cardoso, J. and Junghans, M. Service Semantics. In Fundamentals of Service Systems, pages 137-178, Springer, 2015. Cardoso, J.; Hoxha, J. and Fromm, H. Service Analytics. In Fundamentals of Service Systems, pages 179-215, Springer, 2015. Cardoso, J.; Schmitz, B. and Kieninger, A. Service Research. In Fundamentals of Service Systems, pages 325-357, Springer, 2015. Cardoso, J. and Pinto, A. M. The Web Ontology Language (OWL) and its Applications. In Encyclopedia of Information Science and Technology, pages 754-766, Information Science Pub, 2015. Bicer, V.; Borgert, S.; Winkler, M.; Scheithauer, G.; Voigt, K.; Cardoso, J. and Aitenbichler, E. Modeling Services using ISE Framework: Foundations and Extensions. In Modern Software Engineering Concepts and Practices: Advanced Approaches, pages 126-150, Information Science Pub, ISBN: 1609602153, 2011. Cardoso, J.; Winkler, M.; Voigt, K. and Berthold, H. IoS-Based Services, Platform Services, SLA and Models for the Internet of Services. In Software and Data Technologies, pages 3-17, Springer Berlin Heidelberg, Communications in Computer and Information Science, Vol. 50, ISBN: 978-3-642-20116-5, 2011. Cardoso, J.; Aalst, W. v. d.; Bussler, C.; Sheth, A. and Sandkuhl, K. Inter-Enterprise System and Application Integration: A Reality Check. In Enterprise Information Systems, pages 3-15, LNBI, Springer, ISBN: 978-3-540-88709-6, 2009. Cardoso, J.; Voigt, K. and Winkler, M. Service Engineering for The Internet of Services. In Enterprise Information Systems, pages 15-27, Springer, ISBN: 978-3-642-00669-2 (Print) 978-3-642-00670-8 (Online), 2009. Garcês, R.; Jesus, T. de; Cardoso, J. and Valente, P. Open Source Workflow Management Systems: A Concise Survey. In 2009 BPM & Workflow Handbook, pages 179-190, Future Strategies Inc., Lighthouse Point, FL, USA, 2009. Cardoso, J. Applying Data Mining Algorithms to Calculate the Quality of Service of Workflow Processes. In Intelligent Techniques and Tools for Novel System Architectures, pages 3-18, Springer Berlin / Heidelberg, Studies in Computational Intelligence, Vol. 109, ISBN: 978-3-540-77621-5, 2008. Cardoso, J. Semantics for E-Commerce Applications. In Electronic Commerce: Concepts, Methodologies, Tools, and Applications, Information Science Reference, Pennsylvania, USA, ISBN: 978-1-59904-943-4, 2008. Cardoso, J. The Semantic Web: A mythical story or a solid reality. In Metadata and Semantics, pages 253-257, Springer, Heidelberg, 2008. Cardoso, J. and Aalst, W. v. d. Path Mining and Process Mining for Workflow Management Systems. In Encyclopedia of Data Warehousing and Mining, Encyclopedia of Data Warehousing and Mining, pages 1489-1496, Information Science Reference, Pennsylvania, USA, ISBN: 978-1-60566-010-3, 2008. Cardoso, J.; Lytras, M. and Hepp, M. The Future of The Semantic Web For Enterprises. In The Semantic Web: Real-World Applications from Industry, pages 3-15, Springer, Heidelberg, Germany, ISBN: 0-387-48530-9, 978-0-387-48530-0, 2008. Cardoso, J.; Miller, J. A. and Emani, S. Tutorial Lectures: Web Services Discovery Utilizing Semantically Annotated WSDL. In 4th International Summer School 2008, Venice Italy, September 7-11, 2008, pages 240-268, Springer, Berlin/Heidelberg, 2008. Cardoso, J. Developing Course Management Systems Using Semantic Web Technologies. In The Semantic Web: Real-World Applications from Industry, Springer, Heidelberg, Germany, ISBN: 0-387-48530-9, 978-0-387-48530-0, 2007. Cardoso, J. The Syntactic and the Semantic Web. In Semantic Web Services: Theory, Tools and Applications, IGI Global, ISBN: 978-1-59904-045-5, 978-1-59904-047-9, 2007. Escorcio, L. and Cardoso, J. Editing Tools for Ontology Construction. In Semantic Web Services: Theory, Tools and Applications, IGI Global, ISBN: 978-1-59904-045-5, 978-1-59904-047-9, 2007. Gouveia, A. and Cardoso, J. OWL: Web Ontology Language. In Encyclopedia of Information Science and Technology, Information Science Reference, Pennsylvania, USA, 2007. Patterson, R.; Miller, J. A.; Cardoso, J. and Davis, M. Bringing Semantic Security to Semantic Web Services. In The Semantic Web: Real-World Applications from Industry, Springer, Heidelberg, Germany, ISBN: 0-387-48530-9, 978-0-387-48530-0, 2007. Pennington, C.; Cardoso, J.; Miller, J. A.; Patterson, R. and Vasquez, I. Introduction to Web Services. In Semantic Web Services: Theory, Tools and Applications, IGI Global, ISBN: 978-1-59904-045-5, 978-1-59904-047-9, 2007. Vanderfeesten, I.; Cardoso, J.; Mendling, J.; Reijers, H. and Aalst, W. v. d. Quality Metrics for Business Process Models. In Workflow Handbook 2007, pages 179-190, Future Strategies Inc., Lighthouse Point, FL, USA, ISBN: 0-9777527-1-2, 2007. Cardoso, J. Semantics for E-Commerce Applications. In Encyclopedia of E-Commerce, E-Government, and Mobile Commerce, pages 979-984, Idea Group, ISBN: 9781591407997, 2006. Cardoso, J. Office Automation Systems. In Encyclopedia of Medical Devices and Instrumentation (2 ed. ), pages 149-160, Wiley Publishers, 2006. Cardoso, J. Developing an OWL Ontology for E-Tourism. In Semantic Web Services, Processes and Applications, Springer, 2006. Cardoso, J. Programming the Semantic Web. In Semantic Web Services, Processes and Applications, Springer, 2006. Cardoso, J. and Sheth, A. The Semantic Web and its Applications. In Semantic Web Services, Processes and Applications, Springer, ISBN: 0-38730239-5, 2006. Cardoso, J. Developing Dynamic Packaging Applications using Semantic Web based Integration. In Semantic Web Technologies and eBusiness: Virtual Organization and Business Process Automation, Idea Group, Inc., ISBN: 1-59904-192-8, 1-59904-193-6, 2005. Cardoso, J. Path Mining in Web processes using Profiles. In Encyclopedia of Data Warehousing and Mining, pages 896-901, Idea Group Inc., 2005. Cardoso, J. How to Measure the Control-flow Complexity of Web processes and Workflows. In Workflow Handbook 2005, pages 199-212, Future Strategies Inc., Lighthouse Point, FL, USA, ISBN: 0-9703509-8-8, 2005. Cardoso, J. and Fernandes, J. D. SEED: SEmantic E-tourism Dynamic packaging. In Semantic Web Fact Book, pages 58-60, Joint Special Edition of AIS SIGSEMIS and OPEN RESEARCH SOCIETY, 2005. Cardoso, J.; Miller, J. A.; Su, J. and Pollock, J. Academic and Industrial Research: Do their Approaches Differ in Adding Semantics to Web Services. In LNCS, pages 14-21, Springer-Verlag, Heidelberg, Germany, 2005. Cardoso, J. and Sheth, A. Introduction to Semantic Web Services and Web Process Composition. In Semantic Web Service and Web Processes Conference, pages 1-13, Springer-Verlag, Heidelberg, Germany, ISBN: 3-540-24328-3, 2005. Cardoso, J.; Sheth, A. and Miller, J. A. Workflow Quality of Service. In Enterprise Inter- and Intra-Organizational Integration - Building International Consensus, pages 303-312, Kluwer Academic Publishers, Boston, MA, USA, 2002. Kapitsaki, G.; Ioannou, J.; Cardoso, J. and Pedrinaci, C. Linked USDL Privacy: Describing Privacy Policies for Service. In IEEE International Conference on Web Services (ICWS), 2018. FIlipe, R; Correia, J; Araujo, F and Cardoso, J On Black-Box Monitoring Techniques for Multi-Component Services. In The 17th IEEE International Symposium on Network Computing and Applications (NCA), 2018. Correia, J; Ribeiro, F; Araujo, F; Paiva, R. P and Cardoso, J Response Time Characterization of Microservice-Based Systems. In The 17th IEEE International Symposium on Network Computing and Applications (NCA), 2018. Pina, F; Correia, J; Araujo, F and Cardoso, J Nonintrusive Monitoring of Microservice-based Systems. In The 17th IEEE International Symposium on Network Computing and Applications (NCA), 2018. Lopes, B. L; Pedroso, A; Correia, J; Araujo, F; Cardoso, J and Paiva, R. P DataScience4NP - A Data Science Service for Non-Programmers. In 10º Simposio de Informatica (INForum), 2018. Pedroso, A; Lopes, B. L; Correia, J; Araujo, F; Cardoso, J and Paiva, R. P A Data Mining Service for Non-Programmers. In 10th International Conference on Knowledge Discovery and Information Retrieval (KDIR), 2018. Cardoso, J. Cloud Reliability: Decreasing outage frequency using fault injection. In 9th International Workshop on Software Engineering for Resilient Systems (SERENE), 2017. Cardoso, J.; Mans, R.; Cunha, P. R. d; Aalst, W. v. de; Berthold, H. and Quaglini, S. A framework for next generation e-health systems and services. In Twenty-first Americas Conference on Information Systems, Puerto Rico, 2015, 2015. García, J. M.; Pedrinaci, C.; Resinas, M.; Cardoso, J.; Fernandez, P. and Cortés, A. R. Linked USDL Agreement: Effectively Sharing Semantic Service Level Agreements on the Web. In 2015 IEEE International Conference on Web Services, ICWS 2015, New York, NY, USA, June 27 - July 2, 2015, pages 137-144, 2015. Fernandes, A. F.; Cardoso, J. and Marcelino, M. J. A Systematic Mapping Applied to MOOC's Study. In CSEDU 2015 - Proceedings of the 7th International Conference on Computer Supported Education, Volume 2, Lisbon, Portugal, 23-25 May, 2015., pages 444-449, 2015. Cardoso, J. and Pedrinaci, C. Evolution and Overview of Linked USDL. In 6th International Conference Exploring Services Science (IESS 2015), Springer, LNCS, Vol. , 2015. Macedo, P.; Cardoso, J. and Pinto, A. M. Enriching Electronic Programming Guides with Web Data. In Procs. of the Intl. Workshop on Linked Media (LiME 2014), 2014. Goetz, S.; Ilsche, T.; Cardoso, J.; Spillner, J.; Kissinger, T.; Assmann, U.; Nagel, W. and Schill, A. Energy-Efficient Databases using Sweet Spot Frequencies. In International Workshop on Green Cloud Computing (GCC), pages 871-876, 2014. Goetz, S.; Ilsche, T.; Cardoso, J.; Spillner, J.; Assmann, U.; Nagel, W. and Schill, A. Energy-Efficient Data Processing at Sweet Spot Frequencies. In On the Move to Meaningful Internet Systems (OTM 2014), pages 154-171, Springer, LNCS, Vol. 8842, 2014. Nabais, J. C.; Cruz, A.; Pinto, A. M. and Cardoso, J. Interface Design for IT Service Management. In 9th Iberian Conference on Information Systems and Technologies (CISTI), Barcelona, Spain, 2014. Seiringer, W.; Hottum, P. and Cardoso, J. Increasing Accuracy of Service Costing using Customer Involvement. In SIG SVC Delivering and Managing Services in Systems of Service Systems Workshop, Milano, Italy, 2013. Cardoso, J. Open Service Networks: Research Directions. In Proceedings of C3S2E'13, pages 2-3, 2013. Cardoso, J. Modeling Service Relationships for Service Networks. In 4th International Conference on Exploring Service Science (IESS 1.3), pages 114-128, Springer, Porto, Portugal, LNBIP, Vol. 143, 2013. Cardoso, J.; A. Miller, J.; Bowman, C.; Haas, C.; P. Sheth, A. and W. Miller, T. Open Service Network Analysis. In 1st International IFIP Working Conference on Value-Driven Social Semantics & Collective Intelligence (VaSCo), 2013. Cardoso, J.; Binz, T.; Breitenb"ucher, Uw; Kopp, O. and Leymann, F. Cloud Computing Automation: Integrating USDL and TOSCA. In 25th Conference on Advanced Information Systems Engineering (CAiSE 2013), pages 1-16, Springer, LNCS, Vol. 7908, 2013. Cardoso, J.; Jablonski, S. and Volz, B. A navigation metaphor to support mobile workflow systems. In Second International Workshop on Theory and Applications of Process Visualization (TAProViz'13), pages 537-548, Springer, 2013. Cardoso, J.; Pedrinaci, C. and Leenheer, P. D Open Semantic Service Networks: Modeling and Analysis. In 4th International Conference on Exploring Service Science (IESS 1.3), pages 141-154, Springer, Porto, Portugal, LNBIP, Vol. 143, 2013. Leenheer, P. D; Cardoso, J. and Pedrinaci, C. Ontological Representation and Governance of Business Semantics in Compliant Service Networks. In 4th International Conference on Exploring Service Science (IESS 1.3), pages 155-169, Springer, Porto, Portugal, LNBIP, Vol. 143, ISBN: 978-3-642-36355-9, 2013. Seiringer, W.; Cardoso, J. and Bischhoffshausen, J. K. vo Service System Analytics: Cost Prediction. In 14th IFIP Working Conference on Virtual Enterprises (PRO-VE'13), Dresden, Germany, 30 Sep-2 Oct 2013., Springer, 2013. Seiringer, W.; Hottum, P. and Cardoso, J. Increase Accuracy of Service Costing using Customer Involvement - An Application Scenario based on Service System Analytics. In Proceedings of the SIG Service Workshop, Milan, Italy, 2013. Cardoso, J. and Miller, J. A Internet-Based Self-Services: from Analysis and Design to Deployment. In The 2012 IEEE International Conference on Services Economics (SE 2012), IEEE Computer Society, Hawaii, USA, 2012. Cardoso, J.; Pedrinaci, C.; Leidig, T.; Rupino, P. and Leenheer, P. D Open semantic service networks. In The International Symposium on Services Science (ISSS 2012), pages 1-15, Leipzig, Germany, 2012. Cardoso, J. and Rupino, P. Service Science: concepts, tools and platforms to support digital services for SME. In Workshop on Enterprise Systems and Technology (I-WEST 2011), 2011. Sánchez-González, L.; Ruiz, F.; Garc'ia, F. and Cardoso, J. Towards Thresholds of Control Flow Complexity Measures for BPMN models. In 26th Symposium On Applied Computing (SAC 2011), pages 1445-1450, Taichung, Taiwan, 2011. Cardoso, J.; Barros, A.; May, N. and Kylau, U. Towards a Unified Service Description Language for the Internet of Services: Requirements and First Developments. In IEEE International Conference on Services Computing, IEEE Computer Society Press, Florida, USA, 2010. Cardoso, J. The Internet of Services. In Proceedings of the 4th International Conference on Software and Data Technologies (ICSOFT 2009), pages IS7-IS10, Sofia, Bulgaria, ISBN: 978-989-674-009-2, 2009. Cardoso, J.; Winkler, M. and Voigt, K. A Service Description Language for the Internet of Services. In First International Symposium on Services Science (ISSS'09), Leipzig, Germany, ISBN: 978-3-8325-2169-1, 2009. Dividino, R. Q.; Bicer, V.; Voigt, K. and Cardoso, J. Integrating business process and user interface models using a model-driven approach. In The 24th International Symposium on Computer and Information Sciences (ISCIS 2009), pages 492-497, IEEE, North Cyprus, 2009. Gerke, K.; Cardoso, J. and Claus, A. Measuring the Compliance of Processes with Reference Models. In 17th International Conference on Cooperative Information Systems (CoopIS 2009), Springer, Algarve, Portugal, 2009. Rolón, E.; Cardoso, J.; Garc'ia, F.; Ruiz, F. and Piattini, M. Analysis and Validation of Control-Flow Complexity Measures with BPMN Process Models. In International Workshops on Business Process Modeling, Development and Support (BPMDS), Springer, Amsterdam, The Netherlands, 2009. Spillner, J.; Winkler, M.; Reichert, S.; Cardoso, J. and Schill, A. Distributed Contracting and Monitoring in the Internet of Services. In 9th IFIP international conference on Distributed Applications and Interoperable Systems, pages 129-142, Springer, Lisbon, Portugal, 2009. Cardoso, J. Service Engineering for Future Business Value Networks. In Tenth International Conference on Enterprise Information Systems (ICEIS 2008), pages 15-20, Barcelona, Spain, ISBN: 978-989-8111-37-1, 2008. Kett, H.; Voigt, K.; Scheithauer, G. and Cardoso, J. Service Engineering in Business Ecosystems. In Proceedings of the XVIII International RESER Conference, pages 1-22, Fraunhofer IRB, Stuttgart, Germany, 2008. Vanderfeesten, I.; Mendling, J.; Reijers, H.; Aalst, W. v. d. and Cardoso, J. On a Quest for Good Process Models: The Cross-Connectivity Metric. In 20th International Conference on Advanced Information Systems Engineering (CAiSE 2008), pages 480-494, Springer, Montpellier, France, LNCS, Vol. 5074, ISBN: 978-3-540-69533-2, 2008. Winkler, M.; Cardoso, J. and Scheithauer, G. Challenges of Business Service Monitoring. In Tenth International Conference on Information Integration and Web Based Applications & Services (iiWAS), ACM and Austrian Computer Society, Linz, Austria, 2008. Caires, B. and Cardoso, J. Using Semantic Web and Service Oriented Technologies to Build Loosely Coupled Systems. In 9th International Conference on Enterprise Information Systems (ICEIS 2007), pages 226-232, Funchal, Madeira, Portugal, 2007. Cardoso, J. Business Process Quality Metrics: Log-based Complexity of Workflow Patterns. In International Conference on Cooperative Information Systems (CoopIS'07), Springer, Algarve, Portugal, 2007. Cardoso, J. Integrating HAD Organizational Data Assets using Semantic Web Technologies. In 3rd International Conference Interoperability for Enterprise Software and Applications (I-ESA 2007), pages 333-344, Springer, Funchal, Portugal, ISBN: 978-1-84628-857-9, 2007. Cravo, G. and Cardoso, J. Snapshot-Based Theory: An Interdisciplinary Approach. In 1st Joint International Meeting between the American Mathematical Society and the New Zealand Mathematical Society, American Mathematical Society, Wellington, New Zealand, 2007. Gouveia, M. and Cardoso, J. Tourism Information Aggregation Using an Ontology based approach. In 9th International Conference on Enterprise Information Systems (ICEIS 2007), pages 569-572, Funchal, Madeira, Portugal, 2007. Hrastnik, J. and Cardoso, J. Integrating Heterogeneous Business Process Knowledge for Better Process Models. In The Fifth International Conference on Quality and Reliability, John Wiley & Sons, Chiang Mai, Thailand, 2007. Hrastnik, J. and Cardoso, J. Business Process Knowledge Integration: A Semantic Based Approach. In I-SEMANTICS '07 - 3rd International Conference on Semantic Technologies, within the TRIPLE-I conference, Springer, Graz, Austria, 2007. Hrastnik, J.; Cardoso, J. and Kappe, F. The Business Process Knowledge Framework. In 9th International Conference on Enterprise Information Systems (ICEIS 2007), pages 517-520, Funchal, Madeira, Portugal, 2007. Mendling, J.; Reijers, H. and Cardoso, J. What Makes Process Models Understandable?. In The 5th International Conference on Business Process Management (BPM 2007), pages 48-63, Brisbane, Australia, 2007. Vanderfeesten, I.; Cardoso, J. and Reijers, H. A weighted coupling metric for business process models. In The 19th International Conference on Advanced Information Systems Engineering (CAiSE 2007), CAiSE Forum, Trondheim, Norway, 2007. Cardoso, J. Combining the Semantic Web with Dynamic Packaging Systems. In International Conference on Artificial Intelligence, Knowledge Engineering and Databases (AIKED '06), pages 133-138, Madrid, Spain, ISBN: 960-8457-41-6, 2006. Cardoso, J. Process control-flow complexity metric: An empirical validation. In IEEE International Conference on Services Computing (IEEE SCC 06), pages 167-173, IEEE Computer Society, Chicago, USA, ISBN: 0-7695-2670-5, 2006. Cardoso, J. Approaches to Compute Workflow Complexity. In Dagstuhl Seminar Proceedings: The Role of Business Processes in Service Oriented Architectures, Internationales Begegnungs- und Forschungszentrum fuer Informatik (IBFI), Schloss Dagstuhl, Germany, 2006. Cardoso, J. Discovering Semantic Web services with and without a Common Ontology Commitment. In The 3rd International Workshop on Semantic and Dynamic Web Processes (SDWP 2006), In conjunction with the 2005 IEEE International Conference Web Services (ICWS 2006), pages 183-190, IEEE Computer, Chicago, USA, ISBN: 0-7695-2681-0, 2006. Cardoso, J. Benchmarking a Semantic Web Service Architecture for Fault-tolerant B2B Integration. In International Workshop on Dynamic Distributed Systems (IWDDS), In conjunction with the 26th International Conference on Distributed Computing Systems (ICDCS), IEEE Computer Society, Lisboa, Portugal, ISBN: 0-7695-2541-5, 2006. Cardoso, J. Workflow Quality of Service Management using Data Mining Techniques. In 3rd IEEE International Conference on Intelligent Systems (IEEE IS' 06), pages 479-782, IEEE Computer Society, University of Westminster, London, UK, ISBN: 1-4244-0196-8, 2006. Cardoso, J. Poseidon: Uma aplicacao de suporte ao desenho semi-automatico de workflows. In XATA2006 XML: Aplicacoes e Tecnologias Associadas, pages 337-349, Portalegre, Portugal, ISBN: 972-99166-2-4, 2006. Cardoso, J. Semantic integration of Web services and peer-to-peer networks to achieve fault-tolerance. In Special Session on Semantic Web Services: Theory and Applications, 2006 IEEE International Conference on Granular Computing, pages 796-799, IEEE Society, Atlanta, GA, USA, ISBN: 1-4244-0133-X, 2006. Cardoso, J. and Cravo, G. Verifying the logical termination of workflows. In 5th Annual Hawaii International Conference on Statistics, Mathematics and Related Fields, pages 330-346, Honolulu, Hawaii, USA, 2006. Cardoso, J.; Mendling, J.; Neumann, G. and Reijers, H. A Discourse on Complexity of Process Models. In BPI06 - Second International Workshop on Business Process Intelligence, In conjunction with BPM 2006, pages 115-126, Springer-Verlag, Berlin, Heidelberg, Vienna, Austria, 2006. Cravo, G. and Cardoso, J. Termination of Workflows. In MASSEE International Congress on Mathematics, pages 33-34, MASSEE Mathematical Society of South Eastern Europe, Paphos, Cyprus, ISBN: 9963-9277-0-X, 2006. Cravo, G. and Cardoso, J. Verifying the Termination of Workflows. In International Conference of Numerical Analysis and Applied Mathematics (ICNAAM), pages 85-88, Wiley-VCH Verlag, Crete, Greece, ISBN: 3-527-40743-X, 2006. Rodrigues, T.; Rosa, P. and Cardoso, J. Mapping XML to existing OWL ontologies. In International Conference WWW/Internet 2006, pages 72-77, Spain, ISBN: 972-8924-19-4, 2006. Schmeing, T.; Cardoso, J. and Fernandes, J. D. Knowledge-based Dynamic Packaging Model. In 3rd IEEE International Conference on Management of Innovation and Technology (ICMIT 2006), pages 1085-1089, IEEE Computer Society, Singapore, ISBN: 1-4244-0148-8, 2006. Schmeing, T.; Cardoso, J. and Fernandes, J. D. eTourism: The Knowledge-based Packaging Model. In Workshop on Dynamic and Intelligent Configuration of Tourism Services, University of Twente, The Netherlands, 2006. Silva, B. and Cardoso, J. Semantic Data Extraction for B2B Integration. In International Workshop on Distributed Applications for B2B Integration (DABI 2006), In conjunction with the 26th International Conference on Distributed Computing Systems (ICDCS 2006), IEEE Computer Society, Lisboa, Portugal, ISBN: 0-7695-2541-5, 2006. Cardoso, J. Control-flow Complexity Measurement of Processes and Weyuker's Properties. In 6th International Conference on Enformatika, pages 213-218, International Academy of Sciences, Budapest, Hungary, ISBN: 975-98458-7-3, 2005. Cardoso, J. About the Complexity of Teamwork and Collaboration Processes. In IEEE International Symposium on Applications and the Internet (SAINT 2005), Workshop - Teamware: supporting scalable virtual teams in multi-organizational settings, pages 218-221, IEEE Computer Society, Trento, Italy, ISBN: 0-7695-2262-9, 2005. Cardoso, J. About the Data-Flow Complexity of Web Processes. In 6th International Workshop on Business Process Modeling, Development, and Support: Business Processes and Support Systems: Design for Flexibility, pages 67-74, Porto, Portugal, ISBN: 972-752-077-4, 2005. Cardoso, J. E-Tourism: Creating Dynamic Packages using Semantic Web Processes. In W3C Workshop on Frameworks for Semantics in Web Services, Innsbruck, Austria, 2005. Cardoso, J. Evaluating the Process Control-flow Complexity Measure. In IEEE International Conference on Web Services (ICWS 2005), pages 803-804, IEEE Computer Society, Orlando, Florida, USA, ISBN: 0-7695-2409-5, 2005. Cardoso, J. On the Move to Semantic Web Services. In 6th International Enformatika Conference, pages 13-24, International Academy of Sciences, Budapest, Hungary, ISBN: 975-98458-7-3, 2005. Cardoso, J. and Sheth, A. Adaptation and Workflow Management Systems. In International Conference WWW/Internet 2005, pages 356-364, Lisbon, Portugal, ISBN: 972-8924-02-X, 2005. Correia, M and Cardoso, J. Aumento da resiliencia dos Web services com uma Infra-estrutura Peer-to-Peer. In 6a Conferencia da Associacao Portuguesa de Sistemas de Informacao (CAPSI 2005), Braganca, Portugal, ISBN: 972-95246-3-7, 2005. Cardoso, J. Adaptive Algorithm to Predict the QoS of Web Processes and Workflows. In International Conference on Computational Intelligence (ICCI 2004), pages 490-493, Istanbul, Turkey, ISBN: 975-98458-1-4, 2004. Cardoso, J. Issues of Dynamic Travel Packaging using Web Process Technology. In International Conference e-Commerce 2004, pages 357-362, Lisbon, Portugal, ISBN: 972-98947-8-7, 2004. Cardoso, J. Extending Workflow Systems with QoS Management. In International Conference on Computational & Experimental Engineering and Sciences, pages 599-604, Madeira, Portugal, 2004. Cardoso, J. Building workflows definitions based on business cases. In First International Workshop on Computer Supported Activity Coordination (CSAC-2004), ICEIS 2004, 6th International Conference on Enterprise Information Systems, pages 3-12, Porto, Portugal, 2004. Cardoso, J. and Sheth, A. Semantic Web Processes: Semantics Enabled Annotation, Discovery, Composition and Orchestration of Web Scale Processes. In Fourth International Conference on Web Information Systems Engineering (WISE'03), pages 375, IEEE Computer Society, Roma, Italy, 2003. Cardoso, J. Composing e-Workflows using Syntactic, Operational and Semantic Information. In International Conference WWW/Internet, pages 528-531, Cacilgrafica, Lisbon, Portugal, ISBN: 972-9027-53-6, 2002. Cardoso, J. and Sheth, A. Process Quality of Service Specification. In EI3-IC workshop at NIST, Gaithersburg, MD, USA, 2002. Chandrasekaran, S.; Silver, G.; Miller, J. A.; Cardoso, J. and Sheth, A. Web service technologies and their synergy with simulation. In Proceedings of the 2002 Winter Simulation Conference (WSC'02), pages 606-615, San Diego, CA, USA, 2002. Miller, J. A.; Cardoso, J. and Silver, G. Using Simulation to Facilitate Effective Workflow Adaptation. In Proceedings of the 35th Annual Simulation Symposium (ANSS'02), pages 177-181, IEEE Computer Society, San Diego, CA, USA, 2002. Sheth, A.; Cardoso, J.; Miller, J. A.; kochut, K. and Kang, M. Service-oriented Middleware. In The 6th World Multiconference on Systemics, Cybernetics and Informatics (SCI 2002), pages 528-534, Orlando, FL, 2002. Sheth, A.; Cardoso, J.; Miller, J. 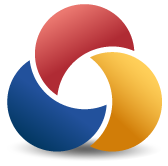 A.; Kochut, K. and Kang, M. QoS for Service-Oriented Middleware. In 6th World Multiconference on Systemics, Cybernetics and Informatics (SCI'02), pages 528-534, Orlando, Florida, USA, 2002. Cardoso, J.; Luo, Z.; Miller, J. A.; Sheth, A. and Kochut, K. Survivability Architecture for Workflow Management Systems. In Proceedings of the 39th Annual ACM Southeast Conference, pages 207-216, ACM Press, Athens, GA, USA, 2001. Cardoso, J. and Teixeira, J. C. Empresa virtual: uma realidade. In Encontro Nacional de Engenharia e Gestão Industrial (ENEGI), Lisbon, Portugal, 1998. Cardoso, J. and Teixeira, J. C. Workflow Management Systems: A Prototype for the University of Coimbra. In 5th International Conference on Concurrent Engineering, pages 83-87, Tokyo, Japan, 1998. Helfert, M.; Ferguson, D.; Mendez Munoz, V. and Cardoso, J. Cloud Computing and Services Science. Springer, ISBN: 978-3-319-62594-2, 2017. Cabello, E.; Cardoso, J.; Ludwig, A.; Maciaszek, L.A. and van Sinderen, M. Software Technologies. Springer, ISBN: 978-3-319-62569-0, 2017. Nguyen, N.T. ; Kowalczyk, R.; Pinto, A.M. and Cardoso, J. Transactions on Computational Collective Intelligence XXVI. Springer, 2017. Lorenz, P.; Cardoso, J.; Maciaszek, L.A. and Sinderen, M. va Software Technologies. Springer, 2016. Cardoso, J.; Fromm, H.; Nickel, S.; Satzger, G.; Studer, R. and Weinhardt, C. Fundamentals of Service Systems. Springer, ISBN: 978-3-319-23195-2, pp. 357, 2015. Holzinger, A.; Cardoso, J.; Cordeiro, J.; Libourel, T.; Maciaszek, L.A. and Sinderen, M. va Software Technologies. Springer, 2015. Cardoso, J.; Fromm, H.; Nickel, S.; Satzger, G.; Studer, R. and Weinhardt, C. Fundamentals of Service Systems. Springer, 2015. Cardoso, J.; Lopes, R. and Poels, G. Service Systems: Concepts, Modeling, and Programming. Springer, Germany, ISBN: 978-3-319-10812-4, pp. 112, 2014. Aalst, W. v. d. and Hee, K. v. Gestão de Workflows. Modelos, métodos e sistemas (Translation by Cardoso, J.). Coimbra University Press, Coimbra, Portugal, ISBN: 978-989-26-000-0, pp. 316, 2009. Cardoso, J. and Aalst, W. v. d. Handbook of Research on Business Process Modeling. Information Science Reference, Hershey, PA, ISBN: 9781605662886 (hardcover) 9781605662893 (ebook), 2009. Cardoso, J. Programação de Sistemas Distribuídos em Java. FCA, Lisboa, Portugal, ISBN: 978-972-722-601-6, pp. 384, 2008. Cardoso, J. and Lytras, M. Semantic Web Engineering in the Knowledge Society. Information Science Reference, IGI Global, Hershey, New York, pp. 424, 2008. Cardoso, J. Semantic Web Services: Theory, Tools and Applications. Information Science Reference, New York, NY, USA, ISBN: 978-1-59904-045-5, 2007. Cardoso, J.; Hepp, M. and Lytras, M. The Semantic Web: Real-World Applications from Industry. Springer, Heidelberg, Germany, pp. 308, 2007. 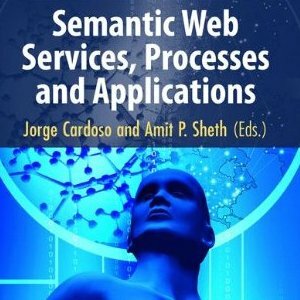 Cardoso, J. and Sheth, A. Semantic Web Services, Processes and Applications. Springer, ISBN: 0-38730239-5, 2006. Cabello, E.; Cardoso, J.; Maciaszek, L. and Sinderen, M. va, ed. Proceedings of the 12th International Conference on Software Technologies. SCITEPRESS, ISBN: 978-989-758-262-2, 2017. Ludwig, A.; Cabello, E.; Cardoso, J.; Maciaszek, L. and Sinderen, M. va, ed. Proceedings of the 11th International Joint Conference on Software Technologies, Volume 2: ICSOFT-PT. SCITEPRESS, ISBN: 978-989-758-194-6, 2016. Ludwig, A.; Cabello, E.; Cardoso, J.; Maciaszek, L. and Sinderen, M. va, ed. Proceedings of the 11th International Joint Conference on Software Technologies, Volume 1: ICSOFT-EA. , ISBN: 978-989-758-194-6, 2016. Lorenz, P.; Sinderen, M. va and Cardoso, J., ed. ICSOFT-PT 2015 - Proceedings of the 10th International Conference on Software Paradigm Trends, Colmar, Alsace, France, 20-22 July, 2015. SciTePress, ISBN: 978-989-758-115-1, 2015. Holzinger, A.; Cardoso, J.; Cordeiro, J.; Libourel, T.; Maciaszek, L. A and Sinderen, M. va, ed. Software Technologies - 9th International Joint Conference, ICSOFT 2014, Vienna, Austria, August 29-31, 2014, Revised Selected Papers. Springer, Communications in Computer and Information Science, Vol. 555, ISBN: 978-3-319-25578-1, 2015. J., C.; Guerra, F; Houben, G.-J. ; Pinto, A.M. and Velegrakis, Y., ed. Semantic Keyword-based Search on Structured Data Sources. Springer, 2015. Cardoso, J.; Sinderen, M. va and Lorenz, P., ed. Proceedings of the 10th International Conference on Software Paradigm Trends. SCITEPRESS, ISBN: 978-989-758-115-1, 2015. Holzinger, A.; Cardoso, J.; Cordeiro, J.; Sinderen, M. va and Mellor, S. J, ed. ICSOFT-PT 2014 - Proceedings of the 9th International Conference on Software Paradigm Trends, Vienna, Austria, 29-31 August, 2014. SciTePress, ISBN: 978-989-758-037-6, 2014. Holzinger, A.; Cardoso, J.; Cordeiro, J.; Sinderen, M. va and Mellor, S., ed. Proceedings of the 9th International Conference on Software Paradigm Trends. SCITEPRESS, ISBN: 978-989-758-037-6, 2014. Cardoso, J., ed. Proceedings of the ICEIS 2008 Doctoral ConsortiumJCS. , Barcelona, Spain, ISBN: 978-989-8111-41-8, 2008. Filipe, J.; Cordeiro, J. and Cardoso, J., ed. Enterprise Information Systems. Springer, Berlin, Heidelberg, LNBIP, Vol. , ISBN: 978-3-540-88709-6, pp. 379, 2008. Cardoso, J., ed. Proceedings of the ICEIS 2007 Doctoral Consortium. , Funchal, Madeira, Portugal, ISBN: 978-989-8111-04-3, 2007. Cardoso, J.; Cordeiro, J. and Filipe, J., ed. Proceedings of the Ninth International Conference on Enterprise Information Systems (ICEIS 2007). , Funchal, Madeira, Portugal, ISBN: 978-972-8865-88-7, 2007. Cardoso, J.; Cordeiro, J. and Filipe, J., ed. Proceedings of the Ninth International Conference on Enterprise Information Systems (ICEIS 2007). , Funchal, Madeira, Portugal, ISBN: 978-972-8865-89-4, 2007. Cardoso, J.; Cordeiro, J. and Filipe, J., ed. Proceedings of the Ninth International Conference on Enterprise Information Systems (ICEIS 2007). , Funchal, Madeira, Portugal, ISBN: 978-972-8865-90-0, 2007. Cardoso, J.; Cordeiro, J. and Filipe, J., ed. Proceedings of the Ninth International Conference on Enterprise Information Systems (ICEIS 2007). , Funchal, Madeira, Portugal, ISBN: 978-972-8865-91-7, 2007. Cardoso, J.; Cordeiro, J. and Filipe, J., ed. Proceedings of the Ninth International Conference on Enterprise Information Systems (ICEIS 2007). , Funchal, Madeira, Portugal, ISBN: 978-972-8865-92-4, 2007. Cardoso, J. and Sheth, A., ed. Semantic Web Process: powering next generation of processes with Semantics and Web services. Lecture Notes in Computer Science, Springer-Verlag, Heidelberg, pp. 147, 2005. Cardoso, J. and Sheth, A., ed. Proceedings of the 2nd International Workshop on Semantic and Dynamic Web Processes (SDWP 2005). In conjunction with the 2005 IEEE International Conference on Web Services (ICWS 2005). , Florida, USA, 2005. Cardoso, J. On the suitability of USDL for service description -- A case study of a telecom operator. Technical Report UC-DEI-GSI-2012-02, Department of Engineering Informatics, University of Coimbra, Coimbra, Portugal, 2012. Cardoso, J. Quality of Service and Semantic Composition of Workflows. Ph.D. Thesis, University of Georgia, Department of Computer Science, Athens, GA, USA, 2002. Cardoso, J. Sistema Computorizado para a Automatizacao de Processos Organizacionais. Master's Thesis, University of Coimbra, Department of Informatics Engineering, Coimbra, Portugal, 1998. Cardoso, J. Service Engineering for The Internet of Service. Porto Salvo, Portugal, 2009. Cardoso, J. Process Management and Integration with SAP. Ciudad Real, Spain, 2008. Cardoso, J. Semantics in Applications. Dresden, Germany, 2008. Cardoso, J. Semantic Web Services and Semantic-based Service Engineering. San Servolo Island, Venice, Italy, 2008. Cardoso, J. ISE - Model-Driven Service Engineering. Stavanger, Norway, 2008. Cardoso, J. Using Semantics to Enhance B2B Integration. Corfu, Greece, 2007. Cardoso, J. Where do the Semantic Web and SOA meet?. Vienna, Austria, 2007. Cardoso, J. Quality Metrics for Business Processes. Zaragoza, Spain, 2007. Cardoso, J. Semantic Web Challenges. University of Bergen, Norway, 2007. Cardoso, J. BPQM: Theory and applications. University of Ciudad Real, Spain, 2007. Cardoso, J. Tools and applications to make organizational knowledge explicit for the Semantic Web. University of Dresden, Germany, 2007. Cardoso, J. 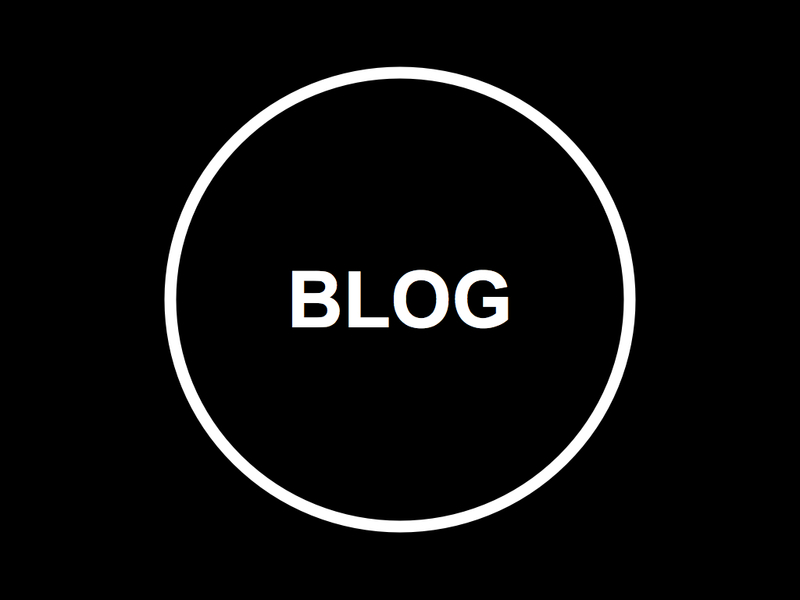 Increasing your ROI by making your organizational knowledge explicit for the Semantic Web. University of Koblentz, Germany, 2007. Cardoso, J. Service Engineering. Barcelona, Spain, 2007. Cardoso, J. Business Process Quality Metrics. Technical University of Eindhoven, The Netherlands, 2006. José Carlos del Arco, J. A. F. &. C. J. C. Presentación. Los Servicios Web desde un punto de vista empresarial y académico. , 2006, n� 183. Cardoso, J. trends for 2005. , 2005, AIS SIGSEMIS Bulletin, March 2005. Cardoso, J. Semantic Web Services: Progress in 2004 and trends for 2005. , 2005, AIS SIGSEMIS Bulletin, March 2005. Cardoso, J. On the move to Semantic Web services. Budapest, Hungary, 2005. Cardoso, J.; Bussler, C. and Sheth, A. Lifecycle of Semantic Web Processes. Porto, Portugal, 2005. Cardoso, J. Semantic Web Processes and Ontologies for the Travel Industry. , 2004, AIS SIGSEMIS Bulletin, October 2004. Cardoso, J.; Curbera, F. and Sheth, A. Service Oriented Archiectures and Semantic Web Processes. New York, USA, 2004. Cardoso, J. Semantic Web Services. Rome, Italy, 2003. Cardoso, J. and Sheth, A. Semantic Web Processes. Erfurt, Germany, 2003. Cardoso, J. Workflow Management Systems: Introduction and Research Issues. Athens, USA, 2002. Cardoso, J. Stochastic Workflow Reduction Algorithm. University of Georgia, USA, 2002. Cardoso, J.; Bussler, C. and Sheth, A. Semantic Web Services and Processes: Semantic Composition and Quality of Service. Irvine, CA, USA, 2002. Cardoso, J. and Bussler, C. MARATHON - Workflow Management System. Seattle, WA, USA, The Boeing Company, 1999.